Two US soldiers who died in eastern Afghanistan on Friday were shot dead by an Afghan interpreter, it has emerged. 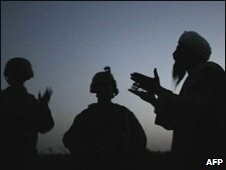 A Nato official said the translator gunned down the US soldiers before other soldiers shot him dead at an outpost in Wardak province. A US military official told Reuters news agency the attacker seemed to be a "disgruntled employee", not a militant. Also in Wardak province, four Afghan soldiers died in an apparently bungled coalition air strike. Afghanistan's defence ministry demanded punishment for those behind the air strike; Nato said the deaths were "regrettable" and announced an investigation. The shootings involving the translator and the air strike were not thought to be related. An Afghan provincial official told Reuters the interpreter had argued with the soldiers over pay and treatment, before opening fire.